If you are publishing on a blog frequently, and you’re also on social media, it’s a really, really good idea to share your blog posts on social media. It creates a link back to your site. It promotes your content to others, who may click through to read or re-share your content. If you do it well and optimize your blog posts for social media, it can lead to more traffic and increased buzz about your site. But if you’re on several social media outlets, like Facebook, LinkedIn, Twitter, Instagram and more, it can take a long time to go and post on each platform after you have already taken time to create great new content. And if you also have a business to run, you may decide you don’t want to spend that time sharing your posts. The solution to your problem may be automation. You might say automation is a hobby of mine. Anytime I can automate my processes I feel like I’ve won a prize. Automating social media posting is just one more way to save time because I’m not getting paid to post on social media, but having a presence on social media helps generate business. I am going to share with you how to automate, I wanted to give you a few reasons why you might not want to automate your posts. First, it can be less personal. (It can be, I’ll get to that.) It lets you post to social media without actually going to social media, which can be lead to a disconnect between you and your followers. My advice when it comes to automating the sharing of your blog posts – don’t let that be the only thing you do on social media. At least once a day login to your accounts, see what’s going on, retweet something, share a photo, respond to a post. Engagement is key. 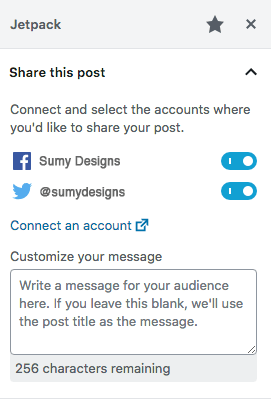 You can toggle on or off the places you want your post to go and you can write a custom message, but that’s about it for personalization. You can’t pick the dates and times it shares, it goes everywhere the minute you hit publish. I don’t like this option for a variety of reasons. I like to pick exactly what time my posts go out. This allows me time to find typos or other types of errors and fix them before it posts and it also lets me drip out my content to different social media accounts over the day or days. It also doesn’t connect to every social media I use, such as Instagram. Instead, I have a different formula I set up using Zapier. If you are new to Zapier, it’s totally awesome. I wrote a blog post here about all the ways I use Zapier for automation last November. It’s a good resource to get you started. If you are on multiple social platforms, I recommend using a social media management tool like Buffer or Hootsuite. There are free levels for both of these. These tools let you write up and schedule posts for days into the future, or write one post and send it to all platforms at once. It can be a real time saver. 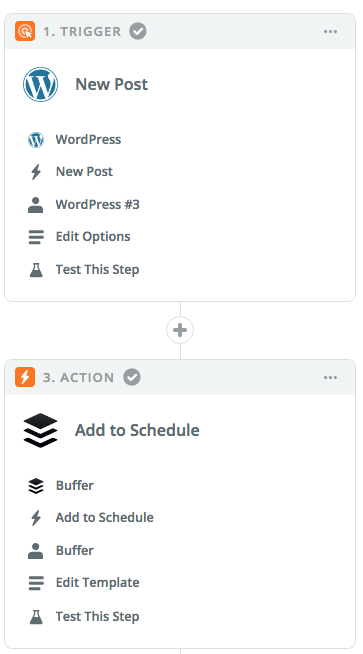 To automate social sharing of your blog post, you then just have to connect your website feed to one of these platforms through a series of triggers and actions. The way Zapier works is that there is first a trigger, something that happens that starts zap. Then there’s an action or actions, what happens after the trigger. For my own automations, I have a trigger which is simply a new post is published on WordPress. When a new post is published, then my action steps start, which are simply my blog posts loading into Buffer and put on the schedule to be published. Here is what it looks like on a basic level. I have a series of actions because I’m on several social media platforms. Each action is set with a different template, so I can customize the message as well as the date and time it posts. I use a custom excerpt on each post to write the blurb that goes with each post. I use the same excerpt on all platforms, but I could use custom post types and create a unique excerpt for each social media platform and connect those in my zap. That would take a lot more time, so I just use the same one. It really depends on how fancy you want to get. Should you automate your posts? Well, that’s up to you. For me, it’s a surefire way to make sure I get my content everywhere without having to individually post to every platform. But if you only use one or two, it may be just as easy to login and write up a custom post and share it each time. Need help setting up your automations? Request a quote and we can help you!